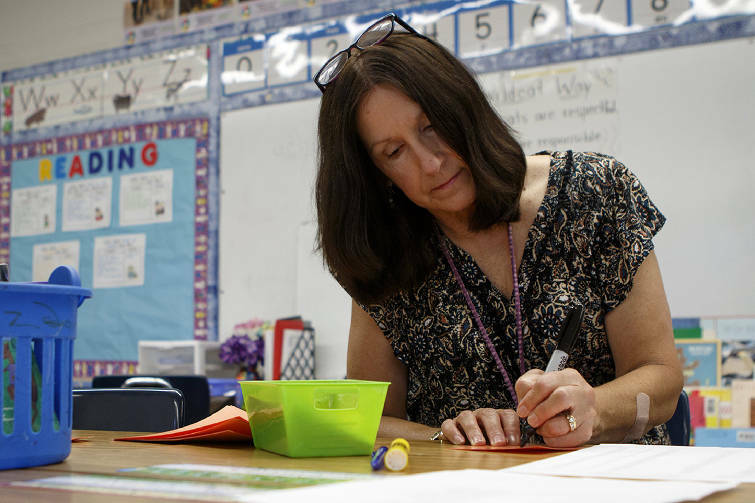 Third grade teacher Julie Warren vacuums her classroom at Hixson Elementary School on Tuesday, Aug. 7, 2018 in Hixson, Tenn.
First grade teacher Carol Lombardi works on writing down her student's lunch numbers while preparing for the first day of school at Hixson Elementary School on Tuesday, Aug. 7, 2018 in Hixson, Tenn.
At least 10 classrooms started off the school year without a teacher in Hamilton County. Currently, the district is covering these positions with substitutes or other support depending on the school's principal, since the school year started Wednesday, according to district spokesman Tim Hensley. As of last week, the district had filled 97 percent of all certified vacancies, with 10 classroom teacher vacancies and 17 school-level classified vacancies currently unfilled, according to Hensley. However, more than 41 certified vacancies are listed online in the district's job portal, along with three administrative positions and 126 classified positions as of Friday. "To staff the vacant positions, we are continuing to source and screen candidates to submit to principals including utilizing candidates that had previously expressed interest in vacancies at other schools," chief talent officer for the district Keith Fogleman said in a statement. Hensley said the school district typically experiences resignations during June and July, continuing right up until the beginning of the school year. "School principals have strategically planned contingencies in the event a school had a vacancy at the beginning of the school year. As an example, some open classrooms are covered by substitutes with additional support to ensure students are receiving quality instruction as the search for full-time teachers continues," he said in a statement. The district has ramped up recruitment efforts, especially in high-needs areas like exceptional education, secondary math and science, English as second language (ESOL) teachers and Opportunity Zone schools, since Superintendent Bryan Johnson came onto the job. These areas are a challenge to staff not only in Hamilton County, but statewide and even nationwide. Last week, former U.S. Education Secretary John King even spoke with some Opportunity Zone leaders about the challenges of recruiting teachers of colors and teachers to teach in high-needs schools. Johnson hired Fogleman last fall to head human resource efforts, and he has since added recruiters and new teacher support staff to his office. "Hamilton County Schools has experienced a strong year in bringing teaching talent into the organization as the market for teaching talent is becoming increasingly more competitive. We have been more aggressive in our recruiting approach by expanding the number of university partners, refocusing our spring recruiting events and hiring teachers from 26 different states to make their home in Hamilton County," Fogleman said in a statement. "We continue to aggressively recruit for the hard to fill positions with a nationwide advertisement in Education Week that includes a $4,000 signing bonus for hard to staff schools. Another source of talent for hard to staff positions are retired teachers who are interested in stepping back into teaching roles," he said. The district has several ESOL positions open, including at The Howard School, Clifton Hills Elementary and East Ridge Elementary, according to the district's job board. Ten exceptional education paraprofessional positions also appear online. There are also 52 food service jobs available. There are more open positions listed online that the number of current vacancies as the district plans for the future, according to Hensley. Some positions noted as interim or temporary might be a future need due to a current employee's upcoming extended absence such as a medical procedure, surgery, or other long-term leave. It is common for school districts to fall short of 100 percent staffing at the beginning of the school year. Metro Nashville Public Schools had 60 classroom teacher vacancies as of the first day of school, according to The Tennessean. At any given time during the year, the district could have 10-15 teaching vacancies that Human Resources is attempting to fill, Hensley said.